Hi! This time I have come up with jquery ajax login form using bootstrap, php oop & mysql database. And the interesting part is, this login form's design resembles Google login form but ours is a modal form built with Bootstrap. I always liked Google's simple and clean style and wanted to try it here and got the chance now. 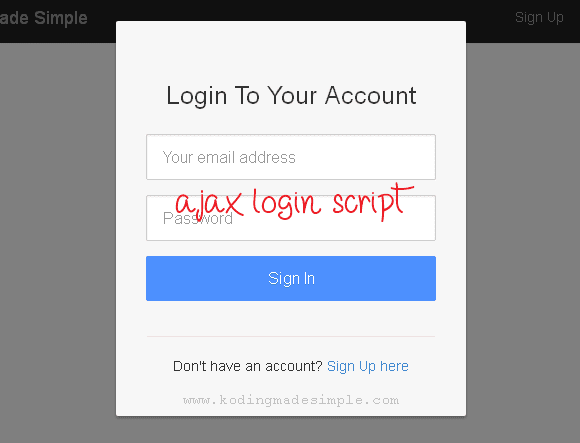 Since our login is a modal form, I'm going to use AJAX to submit form without refresh. So today's tutorial is about building Modal Login Script using AJAX, PHP OOP & MySQL. As for user interface I have used bootstrap but with pretty good customization to the css. Also used PHP for server-side processing and MySQL for backend database. The script has Object oriented programming approach and includes complete login logout system in php. How to Create AJAX Login Form using PHP OOP & MySQL? We'll need database for the demo. So let's create it first. Next create the php class for login module. The class includes three functions 1. userLogin() to authenticate user, 2. userLogout() for logging out user and destroy session and 3. escapeString() which is used to escape user input to avoid sql injection. Next we'll create a separate file for database connection. It uses mysqli library for establishing php connection to mysql server. Please make sure to change the connection details like username, password to yours. We need to create our user interface. Create a file named 'index.php' in application root and build modal form using bootstrap. The modal login form wouldn't be visible at first and would be shown when the user clicks on 'Login' menu on top navigation. 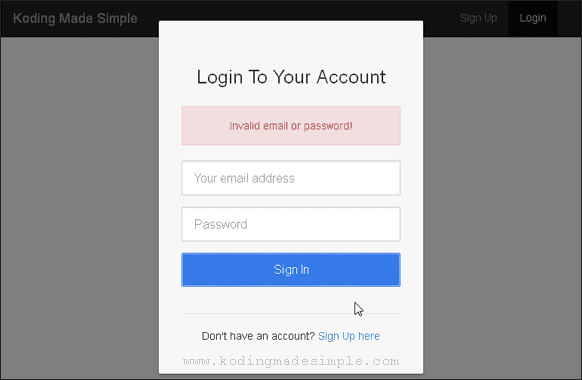 This login form includes jquery validation and both 'Email' & 'Password' fields are required. 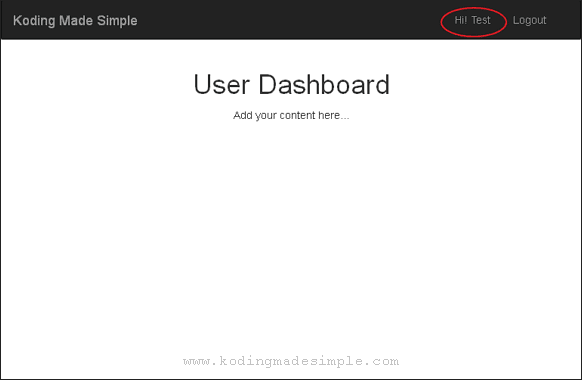 Input fields will be highlighted with red color if user fails to enter the details. Once the user fill in the credentials and clicks on 'Sign In' button, form data will be posted to the backend php script using jQuery Ajax() method. It will be processed there and if user credentials are valid they will taken to the Dashboard page. Else proper error message will be shown in the login form. Next create 'login.php', here is the form data will be submitted and processed against database. This is the dashboard page where the users will be redirected once they are logged in to the website. This page remains inaccessible for guests. Only logged in users get to access it and if not they will be redirected to index page. Then create a file 'logout.php' which will be executed when user clicks on 'Logout' button. The script destroys user session and flush out the user data stored in session variables. Finally our custom stylesheet for the login form. 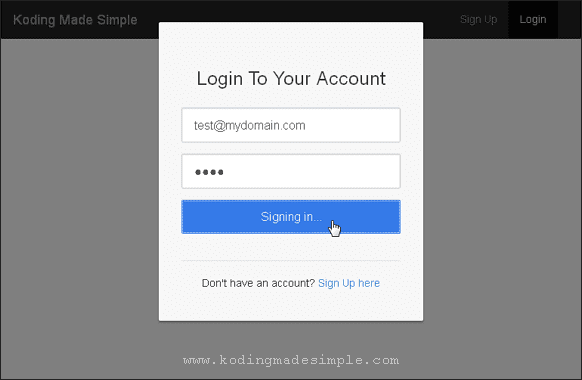 It includes the css I have used to override bootstrap styles and some additional styles for designing the login form. Please make sure to include 'custom.css' after loading 'bootstrap.css' for the styles to kick in and take effect. Done! We have finished the coding part. Now to test this ajax login script, run index.php and you will see page like this. Click on 'Login' button on the top and it will launch the modal login form. To test successful login, enter 'test@mydomain.com' for email and 'test' for password field and click on 'Sign In' button. These are the valid login details, so you will see 'Signing in...' message on the form and will be redirected to Dashboard page. Since you are logged in to the system, you will see 'Logout' button on top menu. Clicking it will logout you and redirects to index page. That accounts for our ajax login logout system. Well! That explains about building ajax login script using php oop, mysql & jquery. I hope you liked this tutorial. Meet you in another interesting post. this post is very interesting. i really enjoyed to read this. whatever you said i really wanna do that.thank you. i need to do this on code igniter how do i do that?? ?